The office was conceptualised with the enclosed spaces as a series of abstract objects principally in white with coloured inner skins set in an office that provided a muted backdrop to the solids. 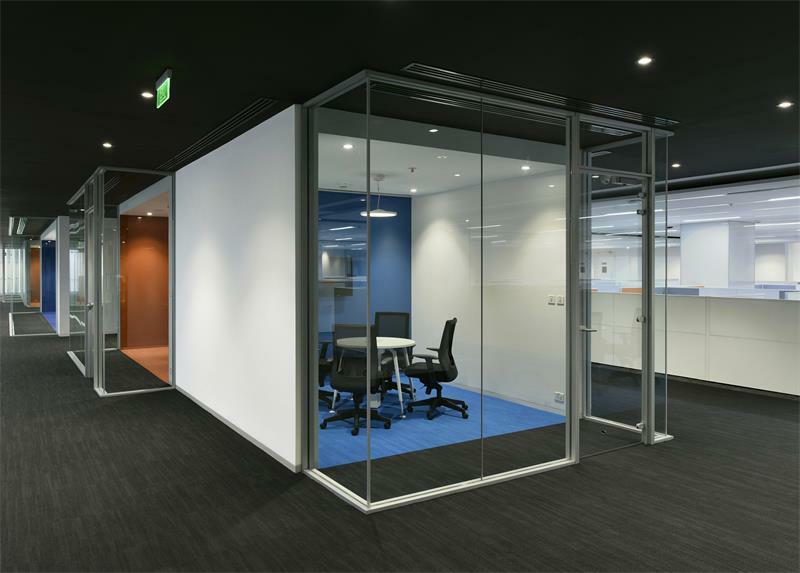 Enclosed spaces are conceived in simple geometric forms, consisting of solid boxes intersected by transparent boxes, and the surround surfaces are finished in dark grey to accord them primacy. The solids are laid out along the primary spine in a staggered and syncopated manner so as to enable longer sight lines and appreciation space for these focal elements. In doing so care has been taken to ensure that they encompass the intermediate structural columns so that the sense of abstraction is heightened. Two clear open office areas emerge on either side of the spine. These are organized logically acknowledging the column grid of the building. This allows for a quieting of the visual noise emanating from the ceiling. Penetration of natural light is ensured, and the glare from the eastern facade has been modulated by the introduction of a screen. Attractive Break Out zones have been located at the end of the spines serving as highlights. The building services have been presented as a series of telescoping abstract white boxes.